This video is the “must see” for anyone currently using, or considering EMDR and EMDR-inspired modalities. 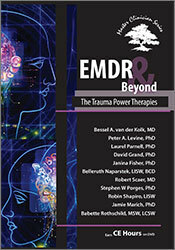 EMDR and Beyond: The Trauma Power Therapies includes the world’s leading experts on traumatic stress discussing the current “power therapies.” Join Bessel van der Kolk, Peter Levine and others as they discuss EMDR, Somatic Experiencing and Brainspotting and other approaches to trauma treatment. In addition they will explore the latest research findings, proposed theoretical mechanisms, innovations and offshoots of EMDR. You will learn about the evolution of EMDR, including clinically inspired modifications, discussed by the pioneers who have been using it since its inception. EMDR and Beyond is the second installment of Linda Curran’s, BCPC, LPC, CACD, CCDP-D, The Master Clinician Series. Linda’s clinical experience and interviewing skill draw out the warmth, wisdom and experience of today’s experts in the most rapidly growing area of psychotherapy and integrative health today, trauma treatment. Details: Multi-disc DVD recording (2 hours, 8 minutes) with instructions. Seminar manual is not available. Linda is the author of best selling Trauma Competency: A Clinician’s Guide (PPM, 2010) and her newest book 101 Trauma-Informed Interventions (PPM, 2013). 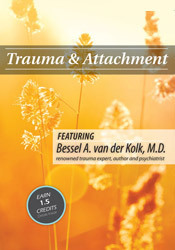 She is the producer of the best-selling Interview Trauma DVD series in which she collaborated with the world’s leaders in Trauma: Bessel van der Kolk, M.D. ; Peter Levine, Ph.D.; Babette Rothschild, MSW, LCS; Stephen Porges, Ph.D.; Janina Fisher, Ph.D.; and many more. Jamie Marich, Ph.D., LPCC-S, LICDC-CS, RMT, is the author of EMDR Made Simple: 4 Approaches for Using EMDR with Every Client(2011), and three other books on trauma recovery. Marich began her career in human services working in humanitarian aid in Bosnia-Hercegovina from 2000-2003. Jamie’s journey with EMDR began as a client in 2004, and she’s offered EMDR therapy as a clinician since 2006. Jamie travels internationally speaking on topics related to EMDR, trauma, addiction, and mindfulness while maintaining a private practice (Mindful Ohio) in her home base of Warren, OH. She is the developer of the Dancing Mindfulness practice and a Reiki Master teacher. She also completed the StreetYoga Trauma-Informed Teacher Training Program and she is a Certified Yoga of 12-Step Recovery Facilitator/Space Holder. Her latest book, Dancing Mindfulness: A Creative Path to Healing and Transformation (Skylight Paths Publishing) was published in the fall of 2015. Stephen W. Porges, PhD, is Distinguished University Scientist at Indiana University, where he directs the Trauma Research Center within the Kinsey Institute. He holds the position of Professor of Psychiatry at the University of North Carolina and Professor Emeritus at the University of Illinois at Chicago and the University of Maryland. He served as president of both the Society for Psychophysiological Research and the Federation of Associations in Behavioral & Brain Sciences and is a former recipient of a National Institute of Mental Health Research Scientist Development Award. He has published more than 250 peer-reviewed scientific papers across several disciplines including anesthesiology, biomedical engineering, critical care medicine, ergonomics, exercise physiology, gerontology, neurology, neuroscience, obstetrics, pediatrics, psychiatry, psychology, psychometrics, space medicine, and substance abuse. In 1994 he proposed the Polyvagal Theory. The theory provides insights into the mechanisms mediating symptoms observed in several behavioral, psychiatric, and physical disorders including autism, anxiety, depression, ADD, PTSD, and schizophrenia. His research has led to the development of innovative interventions designed to stabilize behavioral and psychological states and to stimulate spontaneous social behavior that are being applied to autism and other clinical diagnoses. 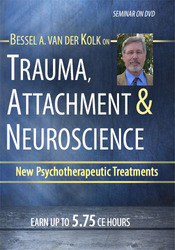 Bessel A. van der Kolk, M.D., has spent his career studying how children and adults adapt to traumatic experiences, and has translated emerging findings from neuroscience and attachment research to develop and study a range of potentially effective treatments for traumatic stress in children and adults. In 1984, he set up one of the first clinical/research centers in the US dedicated to study and treatment of traumatic stress in civilian populations, which has trained numerous researchers and clinicians specializing in the study and treatment of traumatic stress, and which has been continually funded to research the impact of traumatic stress and effective treatment interventions. He did the first studies on the effects of SSRIs on PTSD; was a member of the first neuroimaging team to investigate how trauma changes brain processes; and did the first research linking BPD and deliberate self-injury to trauma and neglect in early childhood. Much of his research has focused on how trauma has a different impact at different stages of development, and that disruptions in care-giving systems have additional deleterious effects that need to be addressed for effective intervention. In order to promote a deeper understanding of the impact of childhood trauma and to foster the development and execution of effective treatment interventions, he initiated the process that led to the establishment of the National Child Traumatic Stress Network (NCTSN), a Congressionally mandated initiative that now funds approximately 150 centers specializing in developing effective treatment interventions, and implementing them in a wide array of settings, from juvenile detention center to tribal agencies, nationwide. His efforts resulted in the establishment of Trauma Center, that consist of a well-trained clinical team specializing in the treatment of children and adults with histories of child maltreatment, that applies treatment models that are widely taught and implemented nationwide, a research lab that studies the effects of neurofeedback and MDMA on behavior, mood, and executive functioning, and numerous trainings nationwide to a variety of mental health professionals, educators, parent groups, policy makers, and law enforcement personnel. Dr. van der Kolk is the author of the NY Times best-selling book The Body Keeps the Score. David Grand, PhD, is the founder and developer of the groundbreaking brain-body based Brainspotting method. Through his Brainspotting Trainings, Inc., he has trained over 8,000 therapists internationally. Dr. Grand is the author of the acclaimed book, Brainspotting: The Revolutionary New Therapy for Rapid and Effective Change and the co-author of This is Your Brain on Sports. Dr. Grand is in demand as a lecturer on a variety of topics. He has accomplished breakthroughs in performance and creativity with his Brainspotting sports work and Brainspotting acting and singing coaching. Dr. Grand has been widely featured in the media including The New York Times, NBC national news, The Discovery Channel, CNN, MSNBC, Sports Illustrated and Sirius Radio. Dr. Grand still finds time for a full-time private psychotherapy and performance practice in Manhattan, NY. Robin Shapiro, LISW is an author, psychotherapist and an EMDRIA-approved consultant, offering consultation to psychotherapists on the gamut of psychotherapy issues including trauma, attachment, endogenous disorders, and countertransference issues. 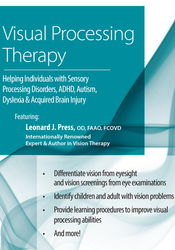 Author of three books, EMDR Solutions I, EMDR Solutions II and The Trauma Treatment Handbook. Leader of EMDR-related workshops including the Two-Hand Interweave, EMDR with Cultural and Generational Issues, Depression, Obsessive-Compulsive Personality Disorders, Medical Issues, Anxiety Disorders, Couples, Complex Trauma and Dissociation. She has presented these workshops at regional and international EMDR International Association conferences and, for many years in, in the Part Two of an EMDR Weekly Class. Janina Fisher, Ph.D. is a licensed Clinical Psychologist and Instructor at the Trauma Center, an outpatient clinic and research center founded by Bessel van der Kolk. Known for her expertise as both a clinician and consultant, she is also past president of the New England Society for the Treatment of Trauma and Dissociation, an EMDR International Association Credit Provider, a faculty member of the Sensorimotor Psychotherapy Institute, and a former Instructor, Harvard Medical School. Dr. Fisher has been an invited speaker at the Cape Cod Institute, Harvard Medical School Conference on Women, Summer and Winter Conference Series, EMDR International Association Annual Conference, University of Oslo, University of Wisconsin, the University of Westminster in London, the Psychotraumatology Institute of Europe, and the Esalen Institute. Dr. Fisher lectures and teaches nationally and internationally on topics related to the integration of the neurobiological research and newer trauma treatment paradigms into traditional therapeutic modalities. Robert Scaer, M.D. received his B.A. in Psychology, and his medical degree at the University of Rochester. He is Board Certified in Neurology, and has been in practice for 39 years. His primary areas of interest and expertise have been in the fields of brain injury and chronic pain, and more recently in the study of traumatic stress and its role in all mental illness, as well as in physical symptoms and many chronic diseases. He has lectured extensively on these topics, and has published several articles on the whiplash syndrome and other somatic syndromes of traumatic stress. His books include The Body Bears the Burden: Trauma, Dissociation and Disease and The Trauma Spectrum: Hidden Wounds and Human Healing. He is currently retired from clinical medical practice, and continues his career in writing and lecturing.